How many Dualies does it take to change a tire? 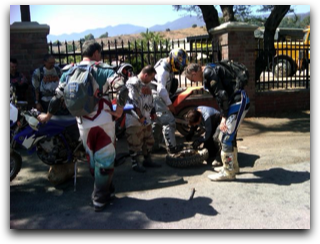 Flat tires probably account for the largest amount of downtime on the trail. 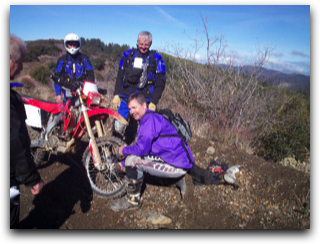 It's always best to have a helping hand from your riding buddies when you need to get back up and running. Riding with a few others increases your chance of success when you combine expertise, tools and experience. Not to mention a few extra hands are always better than the pair you've got. When you're out in the middle of nowhere the last thing you want is to break down without any option to repair. It is important to always carry the minimum amount of tools, spare parts and survival stuff. Check out the sample Dualie rider packs below from Colin and Julie. These lists provide a pretty well rounded survival pack if you happen to get stranded. 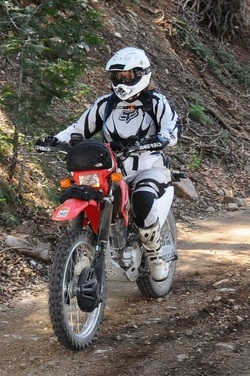 Julie has an extensive list of just about anything you might need for trail repair, food, first aid, communications, survival and the dualsport bike basics. Her list is usually included with the LAB2V ride instructions. Be sure to click her picture to the left and download this incredibly valuable list. 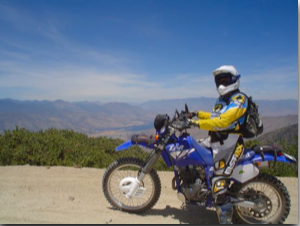 Colin has over 15 years dualsport experience and has assembled a light weight, but highly functional trail pack for the trail complete with emergency health information and first aid. Click his picture to the right to download his well organized pack list. This should go without saying. Considering your body is made up mostly of this item, water is essential over everything else. Riding saps a body of energy quickly. Make sure you have some fuel with you in case you can't make it to civilization in time. Often overlooked, but extremely important. Having someone with you to go for help if you're injured or broken down could turn a bad day into a bright one. It also helps you have some help when you need more than your own two hands. Things come loose, we fall and twist things - make sure you have all the tools and spares necessary to fix whatever might break on the trail. It helps to use your tool pack in the garage to help identify what you may need on the trail for basic repairs. It seems like most riders don't carry so much as a band-aid, but many get scraped or badly hurt. Infections may not happen as quickly as a cut, but they hurt more and can be prevented in most cases with a small first aid kit. You can ride a long way on a dirt bike these days. From elevation and weather changes to temperature extremes between night and day, be sure to dress appropriately and carry extra clothing if you need it. Check the weather report ahead of time and be sure to bring everything you might need. Knee pads, elbow pads, chest protector, boots, gloves, helmet and goggles prevent a lot of major injuries and make a tip over something you can laugh off instead of ending your ride or your life. Be safe when you ride, it's supposed to be fun!